HANA™ is a cloud based environmental control and accessibility platform specially designed for users with mobility challenges, as well as for their families and caregivers. HANA™ is a cloud based environmental control and accessibility platform specially designed for users with mobility challenges, as well as for their families and caregivers. HANA™ platform fills the niche between available on the market traditionally hardware-focused Environmental Control Units (ECUs) and technologically advanced but unspecialized Smart Home Automation solutions. HANA™ platform unlocks Internet of Things (IoT) and speech recognition technologies for people with mobility limitations and their caregivers. The user interfaces and human-system interaction processes implemented in HANA™ platform have been developed with extensive input from our users and experts at the Assistive Technologies Department and the Spinal Cord Injury Clinic of the Health Sciences Center of the Winnipeg Regional Health Authority (HSC WRHA). Users can operate devices connected to HANA™ through a scanning menu, voice control, and/or shortcut activation. HANA™’s web-based device management software allows users to customize the system through command creation and shortcut activation to best suit their individual needs. HANA™ also provides caregivers or family members the ability to remotely monitor and control all devices from their computer or phone. HANA™ can connect multiple devices that are easily controlled through a user’s wheelchair and/or bed. Additional devices can be added to the system at any time. The system can be activated and utilized through a user’s existing button/switches, sip and puff straw or through voice commands. Easily control the home environment through customized voice commands. An easy-to-use drag and drop interface on the online device management software allows users to customize their action menu, create shortcuts, and add new actions. The system also allows users to customize device settings, such as: quiet time, HANA™ playback speed and volume, voice pack selection, and wake-up command customization. Commonly used actions can be added to a user’s main action menu for easy task selection. Users can also create shortcuts for favorite commands that will activate an action in seconds. Caregivers and/or loved ones can activate devices manually or remotely through the online manager. SIRI or Google Now can be accessed through HANA™ for phone calls, weather, directions, and more. Our team of HANA™ support staff are available to troubleshoot and resolve any issue a user may encounter. HANA™ understands that individual needs and requirements are different. Extensive customization allows HANA™ to best suit each individual user. Customization features include adjustable speed for the scanning menu, customized voice recordings for personal preference and/or language preference, configurable menu on the HANA™ device management platform, and much more. 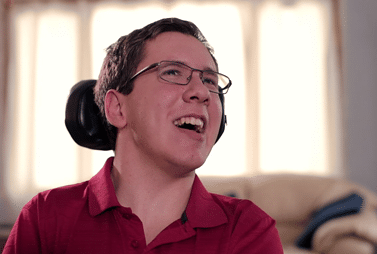 As Nancy and Joseph Savoie have watched their son Luke over the years, they realized that their comfortable two-storey Winnipeg home was limiting his ability for independence. Luke uses a power wheelchair and does not have the ability to do everyday tasks we all take for granted. He must rely on his parents and caregivers to help him operate devices, like the microwave or television, or to simply turn things on and off. Luke used to call us for assistance 5-10 times an hour. Simple tasks can become herculean for wheelchair users without the help of caregivers. This is why Luke’s dad, Joseph, encouraged him to attend the Prairie Seating Workshop, a local seating and mobility conference, to see what new innovations were on the horizon. This conference changed their lives for the better when Luke and his father were introduced to HANA™. “Shortly after arriving at the conference, an Occupational Therapist who knew that I like to try stuff out found me, and she said, ‘If you like to try new things, you should come and check this out,’” said Luke. This was Luke’s first introduction to HANA™. HANA™ is not an individual, but a specialized home automation platform for those who need assistance in controlling their home environment and simple everyday tasks. HANA™ stands for Home Access Network Assistant. The team of technologists from Norima Innovations were at the conference demonstrating HANA™ capabilities with the ultimate goal of enlisting the help of a few early adopters. As Luke approached the exhibit, the Norima team quickly offered Luke the opportunity to try the technology. Through a few simple voice commands, Luke was able to operate lights, turn on and off a fan, and even adjust the tilt of a power bed. HANA™ can assist its users in controlling lights, appliances, beds, phones, and televisions from a power wheelchair and/or bed. Using a scanning menu, voice control, and/or shortcut activation, HANA™ allows for unparalleled mobility and independence. [Norima] actually allowed me to try HANA™ right then and there, and it worked perfectly. When I came home from seeing HANA™, I told my mom about it and funny thing is we were trying to brainstorm about something like HANA™ and here she [HANA™] was. I went into my room and started to cry because I knew it would change my life. The Norima Innovations team contacted Luke in early 2016. Luke was one of the early adopters of HANA™, and he helped the team at Norima Innovations refine the technology and get it ready for market. “HANA™ has affected my life in so many different and good ways. I cannot even describe [the ways] it has affected my life,” said Luke. Just recently, Luke’s wheelchair lift that gets him to his basement rec room has been added to the list of devices on Luke’s HANA™ home network. Luke, his family, and a number of other early adopters are aiding Norima Innovations as they make their final preparations for market. Giving Luke the ability to be more independent gives us more peace of mind. Now he can be left alone for longer periods of time in a safe environment, and we don’t have to worry. That’s a huge thing for us. The primary package is intended for wheelchair mounting and is installed throughout the home. The primary package is used to connect the user’s living room, kitchen, and/or bathroom. Common device connections include: kitchen, living room and/or bathroom lighting; front or back door; power wheelchair; and television, radio, and other small appliances/devices. The secondary package is intended for bed mounting and is installed in the user’s bedroom. Common device connections include bedroom lights, power bed, bedroom television, radio, or other small devices. Note: A customer must already own a primary package to be eligible to purchase a secondary package at a later date. An additional $800 installation fee will be applied if a secondary package is purchased at a later date than the primary package. The complete HANA™ bundle includes all components in the primary and secondary package. The complete HANA™ bundle connects the user’s entire home; bedroom, living room, kitchen, and/or bathroom. Functionality of the primary and secondary packages are combined to provide the ultimate HANA™ home experience. The complete HANA™ bundle is the best value option. * All users are required to pay a monthly service fee of $25.00. Additional service charges may apply if a return visit is requested after the original installation. HANA™ comes with a three-month warranty program. If a customer is not completely satisfied with their purchase, a HANA™ installer will uninstall the system from the user’s home. A refund will be issued to the customer amounting to the purchase price of the system, minus a $500 cost for installation. HANA™ may be covered if you have experienced injury from a collision or work incident. Contact your case worker at MPI or WCB for insurance coverage information. Funding may be available for the purchase of HANA™ through various sources. Contact your support organization, ILRC, SMD, EIA, and others for possible funding options. If you are interested in HANA™ but are experiencing difficulty finding financial aid, please contact us at Funding@MyHANAHome.com. HANA™ has been certified for use in both Canada and the United States. For further information, please see the TÜV Rheinland Certificate Database. If you have questions regarding HANA™, please take a look at some of our frequently asked questions. If your question hasn’t been answered, please contact us. How will HANA™ help me? HANA™ has been specially designed to provide customized home automation for wheelchair users. The ability to use the device through button/switch, sip and puff, and/or voice command allows users to control their home environment in a way to best suit each user’s needs. HANA™ users experience increased independence, freedom, and confidence! How will HANA™ help my caregiver? 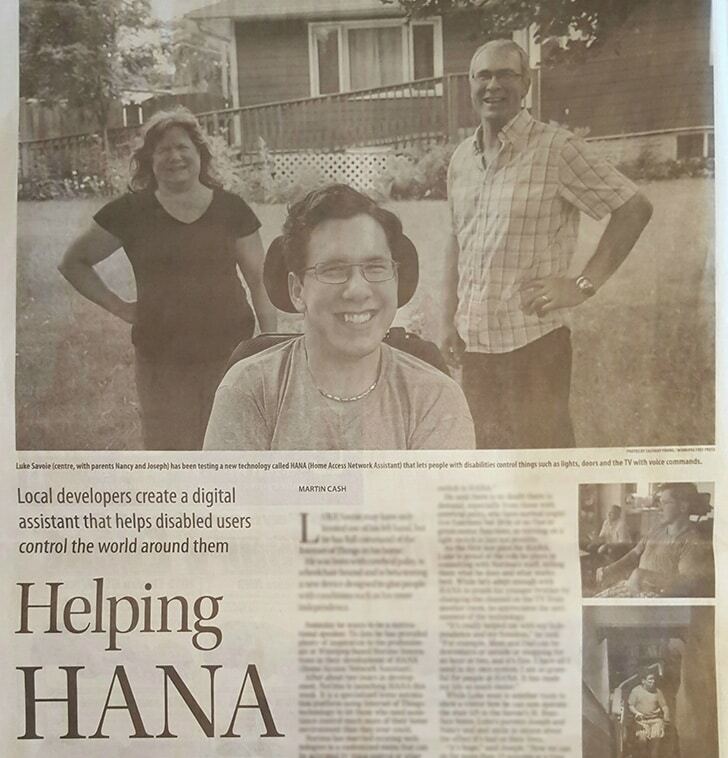 HANA™ creates a new independence for its users and caregiver(s). The increased independence and control of one’s environment helps reduce the number of caregiver calls placed by users. HANA™ also allows caregivers to remotely access the devices on a user’s HANA™ network. This allows caregivers to check the status of one’s devices and remotely turn on/off devices and lights if required. Is there a monthly service fee to use HANA™? Yes, there’s a $25.00 monthly fee for each user. Is HANA™ certified for use in Canada or the United States? Yes, HANA™ has been certified for use in both Canada and the United States. 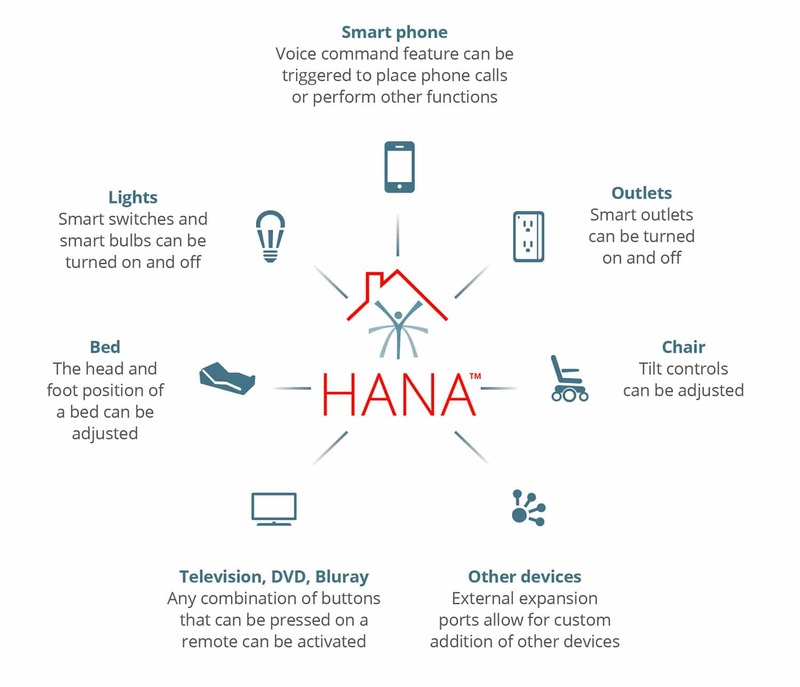 What do I need for HANA™ to work in my home? HANA™ needs to be connected to the internet. A user must have their own home internet connection with WiFi capability. A user must already possess their own operating switches/buttons, and/or sip and puff unit. If a user does not have these devices, it’s recommended that they visit their occupational therapist for assessment before installing a HANA™ device. What can I connect to my HANA™ system? HANA™ can connect to a number of devices such as lamps, automatic doors, televisions, cell phones, power beds, Nest thermostat, etc. HANA™ is compatible with most small devices that can be remotely controlled or have a basic on/off switch. Specialty devices such as wheelchair lifts are subject to device compatibility. Specialty devices that operate through remote control may be HANA™ compatible; however, a pre-assessment from our certified HANA™ installer is required. What is a specialty device? 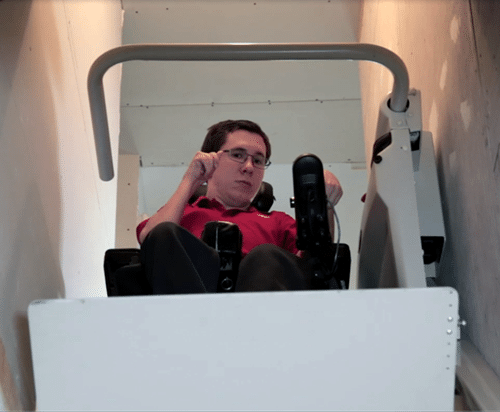 A specialty device would include a wheelchair lift, ramp, etc. These devices are complex and require additional components and labour in order to connect to HANA™. A HANA™ installer would be required to assess the compatibility of these devices before installation can be assumed. Depending on the complexity and labour requirements assessed, an additional installation cost may occur. Can I expand my HANA™ system (i.e. add additional devices to the system after installation)? Yes! Additional outlets and light switches can be purchased online or at various retailers (Home Depot, Best Buy, etc.). These outlets and light switches can be easily added to a user’s system through the online HANA™ manager. A certified HANA™ installer can also assess the possibility of adding specialty devices to a user’s HANA™ system, such as a wheelchair lift. What will happen if my internet connection is lost? The loss of an internet connection will impact certain HANA™ functions. Functions that will be affected include voice control, beacon access (sending text messages), and smart things access. Access to devices that do not require internet connection will not be affected. These include local devices such as a television, cellphone, door, and other expansion port devices. What will happen if there’s a power outage? In the case of a power outage, HANA™ functionality will be impacted. Devices that require a power source for operation will be affected and will not be accessible through the HANA™ system. 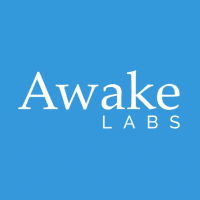 Devices with battery backup that are connected to our HANA™ system will be operational. Devices that require internet connection will also be unavailable. Common device connections that WILL NOT be affected by a power outage include cellphone access, door access, and power chair functions. Common device connections that WILL be affected include bed functions, television, lights, stereo, etc. Where can I purchase HANA™? Can I purchase only a secondary bedroom package? Customers are only eligible to purchase the secondary package if they already own a primary wheelchair package. The secondary package will not function without the installation of a primary package. An additional $800 installation cost will also be applied if the secondary package is purchased at a later date than the primary package. What’s included in the package prices? 24/7 technical support services*Installation and training appointment costs are not included in the Secondary package. Extra costs will occur. What is the HANA™ return policy? When will my HANA™ system be installed? When a customer purchases a HANA™ device, a one-hour pre-installation assessment will be scheduled. A certified HANA™ installer will meet with the customer and primary caregiver(s) during the scheduled pre-installation assessment. During the appointment, the installer will determine device connections and network compatibility. Once the assessment is complete, the installer will arrange for an installation appointment. During the installation appointment, the installer will install and train the user and their caregiver(s) on operating their new system. The pre-installation assessment and installation appointment must be scheduled at a time that both the customer and their primary caregiver(s) are available. Who covers the cost of HANA™? If the acquisition of HANA™ is not covered through insurance, the purchase of HANA™ is a private cost for the user. Funding may be available through various support organizations. What if I cannot afford HANA™ but need it for greater independence? Funding may be available for the purchase of HANA™. Contact your support organization for possible funding options. If you’re interested in HANA™ but are experiencing difficulty finding financial aid, please contact us at Funding@MyHANAHome.com. We will be glad to assist you in finding funding options. What does the online management system do? 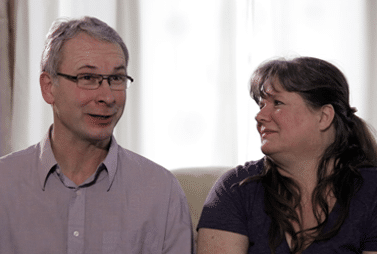 How does the online management system benefit me? The software allows users to customize their HANA™ system to best suit their needs. Customization options provide for a unique user experience that’s tailored to one’s specific requirements and needs. How does the online management system benefit my caregiver(s)? HANA™ allows caregivers to remotely access the devices on a user’s HANA™ network. This allows caregivers to check the status of one’s devices and remotely turn on/off devices and lights if required. Remote access to device status gives caregiver(s) peace of mind knowing devices have been turned off during the night. How do I access the online management system? The online management software can be accessed via computer/laptop, tablet or mobile device. Who can access the online management system? Each user will have their own primary account. Primary accounts allow users to manage devices, as well as manage who will have access to your HANA™. Access can be given to family members, caregivers and/or close friends. This will allow family and caregivers access to the user’s HANA™ system for remote monitoring. Each account will be protected through a unique username and password. Can I change who has access to my online management system? Yes. Accounts can be created, modified and deleted at any time by the owner. What do I do if I encounter a problem with my HANA™ system? Our HANA™ Care Support Team is here to help! If you experience any difficulties or issues with your system, our support team will be happy to assist you. Our team can be reached by email at Support@MyHANAHome.com. Want to learn more about HANA™?